Each girl sits on her own front porch, waiting for the other to apologise, even though they know they'll never speak to each other again, no matter how bored they get. But then the sounds of feet slapping the pavement and voices chanting double-dutch rhymes drift up the avenue, and neither one can resist going out in the street to play. 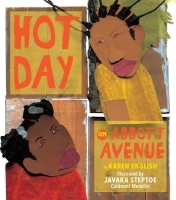 This lyrical friendship story, the first collaboration of two outstanding artists, pairs a rhythmic text with distinctive collage illustrations. Its subtle message about sharing and forgiveness will resonate with anyone who has ever experienced the ups and downs of being, and having, a best friend. It's the hottest, stickiest day of the summer. A fat-sun-in-the-sky day. An eating-ice-pops-on-the-porch day. And for Kishi and Renee, it's a best-friends-breakup day.